After observing her daughter's recent interest in Disney's Fairy tales, artist Dina Goldstein was inspired to create the "Fallen Princess" series, which shows the famed Princesses in dark modern-day dramas. As a young girl, growing up abroad, I was not exposed to Fairy tales. These new discoveries lead to my fascination with the origins of Fairy tales. I explored the original brothers Grimm's stories and found that they have very dark and sometimes gruesome aspects, many of which were changed by Disney. I began to imagine Disney's perfect Princesses juxtaposed with real issues that were affecting women around me, such as illness, addiction and self-image issues. 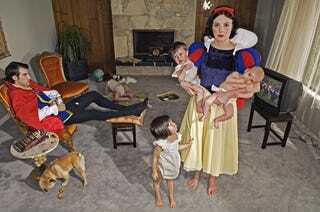 Goldstein gives the Princesses adult lives that contrast strangely with their Fairy-tale garb. She places Cinderella in a dark bar, Snow White surrounded by kids and a lazy husband, Rapunzel in a chemo ward, and Princess Jasmine in Iraq. Goldstein turns the familiar narrative into something uncanny, and thus calls attention to the formulaic stories of the Disney classics, which bastardize the original fables in order to create something more blandly cheerful. Goldstein views her work as a sort of return to the violence of the original stories, a way of articulating the unpleasant history of the Grimm fairy tales through a modern setting. In a similar vein, filmmaker A.D. Calvo has announced that he is planning on creating a twisted version of Snow White, which will be released shortly after Tim Burton's Alice in Wonderland. Calvo says Snow White will feature controversial themes like drug abuse and teen suicide. "Although a fantasy, this is hardly a fairytale," said Calvo. "It's much more about despair than anything else. I'm looking to explore dark romanticism as it relates to modern culture. I realize some might find my interpretation a bit disturbing," he says. "This is not your mother's Snow White." While neither Goldstein nor Calvo are doing anything particularly new or shocking—after all, both consider their work a return to the darkness of the original tales—there is something refreshing about seeing the ubiquitous image of the beautiful and passive Princess toppled. Maybe it is just the goth teenager in me, but I enjoy seeing the shellacked versions of female perfection thrown into the unhappy reality of modern life. At least it is an improvement over all the self-proclaimed modern "Princesses" walking the streets today.